In my Africa in World Politics class this week, I’ve been talking about the role of African states in global economic governance. This has been a focus of my own research, stressing the important roles coalitions can play, but how those roles are strongly influenced by the institutional and strategic environments that states operate in. At the World Bank or IMF, African coalitions tend to have no impact due at least partly to the power and voting structure of those institutions. At the WTO, coalitions have had major impacts in negotiations (the Cairns Group in the Uruguay Round, the “Cotton Four” group of African countries more recently). Right now many of the important issues regarding our global economy are being debated by a forum of industrialized and emerging market countries, the G20. Their meeting in London next month, appropriately is targeted at dealing with the current financial crisis and its spillover effects.There is one African state member of that group, South Africa, and other African states are expected to be present in less formal roles as well. There is some hope that African issues will have a place on the agenda at the G20 meeting. But as Kofi Annan argues in a guest column on AllAfrica.com, Africa needs to have more systematic representation at the G20 if the G20 is going to be an important decision-making forum. Also, African states need to continue their hard lobbying for greater voice at the IMF and World Bank, especially given the important role the IMF plays in developing the norms of the global financial system. My suggestion would be that African states concentrate on encouraging decision-making rules that favor coalitional behavior. If the lessons of the WTO tell us anything, it is that some institutional settings provide greater scope for developing country influence than others. News and Comment: South Africa does what China wants? The BBC (see below) is reporting that the South African government may be bowing to pressure from China in its decision to block the Dalai Lama’s entry. If true (and what other reason could there be? ), it is yet another signal that doing business with China carries its own conditions. And if South Africa cannot stand up to such pressures, what other African states can? 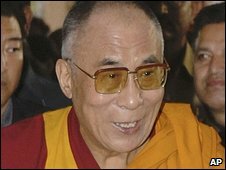 The South African government has defended its decision to deny entry to the Dalai Lama, amid charges it is bowing to pressure from China. The Tibetan spiritual leader was due to attend a peace meeting in Johannesburg this week, along with fellow Nobel laureates Desmond Tutu and FW de Klerk. But the authorities have not granted an entry visa, saying the invitation did not come from official channels. Archbishop Tutu has threatened to pull out of the conference over the issue. Speculation is rife in the local media that the government caved in to pressure from Beijing. On Friday, Johnnie Carson became Obama’s official nominee for US Assistant Secretary for African Affairs at the State Department (via allAfrica.com). A number of observers have worried about how long it took him to name someone to this post, that it is an indication of Africa’s low priority in the Obama administration. But the choice itself demonstrates that Obama has decided to select someone with a long diplomatic history with the the continent (beginning as a Peace Corps volunteer in Tanzania and including ambassadorships to Kenya, Zimbabwe and Uganda). What, exactly, does Carson’s nomination signal? At least one blogger has mused that Carson could be tough on Museveni in Uganda, perhaps promoting a pro-democracy agenda there. Yet another observer seems concerned that the choice signals a lack of intention on the part of the Obama administration to effectively deal with the crisis in the DRC. Carson seems to me to be a strong choice. He has great experience with the continent and will likely be respected by most African leaders. But he is also a safe choice. It is unclear that the Obama administration is making any significant move to change US policy in the region. It would be nice, for instance, if we saw (as one of the observers mentioned above has opined) a special envoy for the crisis in the DRC. The Monkey Cage: A New Rating of Colleges: Surf’s Up! The Monkey Cage, a favorite blog of mine, has posted an important ranking of colleges from Surfline (via Inside HigerEd) based on their appeal to surfers. I’m happy to see my undergrad institution, UC San Diego, is at the top. I never was a surfer (unless a couple tries counts), but I can attest to the fact that the beaches there were fantastic. Now that I’m out East, I suppose I’ll have to check out the nearby spots, especially since the University of Rhode Island made #7 on their list. The BBC and others have been reporting over the past day or so that the African Union has suspended Madagascar’s membership since the coup earlier this week. This echoes the Southern African Development Community’s (SADC) decision not to recognize the new “interim” president, Andry Rajoelina. Alistair Thomson, at Reuter’s Blogs, notes that between starting in 2005, there was a period of three years without coups in Africa, a trend that changed in 2008. I believe he is likely referring to a period bookended by the bloodless coup in Maurtiania in August of 2005 and the more recent coup there in August of 2008. However, the relevance of that stastic is probably undermined by attempted coups during this period (alleged attempts in Cote d’Ivoire and the Gambia, for instance) and major election fiascoes in places like Kenya and Zimbabwe. Nonetheless, it is clear that 2008 and 2009 (so far) have not been great years for Africa’s political systems. The consequences of this? Alistair rightly mentions that the recent spate of political instability does not help Africa’s investment climate. Will this change? Alistair also rightly notes that the recent financial crises are only likely to increase the pressures current governments face and the disatisfaction of opposition groups within the countries. And while the AU is clearly on the right side in condemning the coup, its current leader, Gaddafi, is unlikely to promote the kind of democratic stability in Africa most Western observers would like to see. And we can wonder about the future of African leadership on these issues. Mbeki, for all his faults, could at least be credited with having a vision for responsible African leadership on the continent, but he is no longer in a position to promote his African Renaissance. BBC NEWS | Africa | Africa rejects Madagascar ‘coup’. Lova Rakotomalala at Global Voices tells us that the President of Madagascar has resigned. Duncan Green has a favorable early review of the new World Bank study, The Moving Out of Poverty Study. More about the book can be found on the World Bank’s website. According to the website it is due to be released sometime this month and is available for pre-order.